Did You Know That Some Of Our Founding Father’s Believed in Astrology? As it turns out, George Washington, Ben Franklin and Thomas Jefferson, were ALL staunch believers in Astrology. Some suggest that the timing of the laying of the corner stone of the Capital Building was insisted upon by George Washington, on 9/18/1793, between the hours of 11:15 and 12:30. Another historical astrological coincidence is that the cornerstones for the White House and the Washington monument, the two other buildings that form the federal triangle and were built years later were all coordinated to be laid while Caput Draconis was in Virgo. Those of us that believe in Astrology (and shame on you if you don’t ;-)) – know that the time sets the stage to everything. Timing is key when it comes to astrology and it looks like our very first president knew this philosophy practiced it in real life. The moment something is born – whether it be a person, an event or the beginning of an important building being built – is very important from an astrological perspective. It is because at the moment something is born – the planets have a story to tell about it and the story can be ever so fascinating. From a historical perspective, there’s actually quite a bit of proof all throughout American’s history of powerful people citing their beliefs in astrological phenomenon. One of my favorite lines was spoken by JP Morgan – a very successful and powerful financier who created a fortune while dominating the financial markets of his time. He stated, “Millionaires don’t use astrologers – but billionaires do” and there’s known proof that he regularly visited an astrologer. So believing in astrology certainly seems to not be so kooky now does it? After all …… how could one argue with such instrumental people in American history? By the way, if you were born in 1953/54, 1965/66, 1977/78, 1989/90 or 2000/01 your Jupiter will be returning to its home base in your chart at some point in 2013. So, you too, will have your Jupiter return and begin a brand new 12 year cycle. It’s definitely something to look forward to since it typically denotes a period where you feel rejuvenated again. You tend to become “fresh” and ready for new things. I’m personally excited about it because my return will also happen this year. Where ever Jupiter lives in your chart, he will give you a sign as to where this new “rejuvenation” will take place. It’s typically the beginning of something new and you tend to feel good and excited about things. Your outlook is positive and you feel like you are ready to grab whatever it is that you’re trying to reach. However, there’s another side to my lucky friend that I’d like to share. In the beginning of my Astrology studies I was always excited by a Jupiter transit since he’s typically known as the “good-luck” planet. For the most part that’s true and I continually see him bring good fortune….. when he’s behaving. BUT – when he’s showing his unruly side, he can blow things up – including our egos and the way we perceive things. Did you ever encounter someone who suddenly turned “egotisical” and started acting a little “too” confident? He or she likely aggravated you because of that uber-confidence. Now – I’m not saying anything is wrong with a little confidence but there are times when people can get a little too inflated if you catch my drift 😉 That expansion or blowing up of one’s confidence is an effect of the challenging side of Jupiter. He is the biggest planet after all – so it makes sense that his energy could affect our egos in this over-confident way. 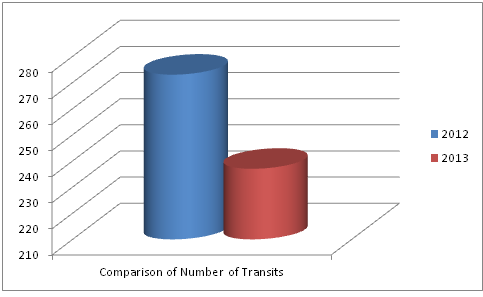 I love looking at certain types of data and one of my favorite programs for doing so is Excel. I’m sure that most of us use it for work purposes but I’m sure a good amount of us also use it to keep track of our finances and personal budgets. However, I found a neat place to use Excel in my Astrology practice and I thought I’d share since we’re embarking on a new year. A while ago I actually started taking a look at our Astrological triggers from a data standpoint in order to see trends in a person’s whole year. I decided to pin it – “Datastrology” since it’s taking your personal data and Astrologizing it! We use data to analyze many things and gather trends but what a neat concept to use it when it comes to OUR upcoming year. Datastrology could even be used to compare activity from year to you – since we all know some years are much more activity based than others. Astrology is not a crystal ball but it can very much differentiate active vs. duller periods in your life. It’s actually pretty neat if you look at your year and see which months are going to be more eventful. 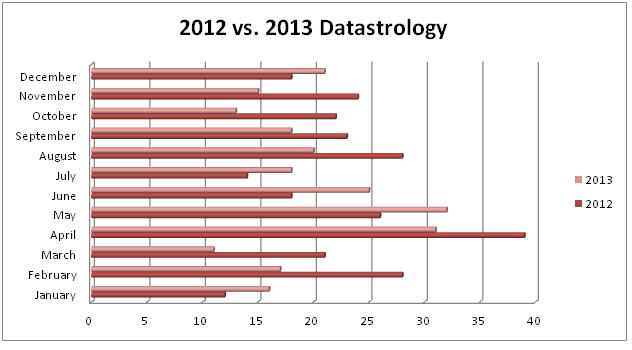 My version of datastrology makes no differentiation between challenging times vs. easier one. Since we can label planetary triggers as easy vs. challenging you could look at your datastrology to see if there’s a trend of challenge or ease. What I’ve done below is the easy version. As an example I used my own chart. I simply took ALL of my major planetary happenings and put them together to illustrate which times will be more active than others. It’s actually pretty neat and totally not scary … it just illustrates which months will be more eventful than others. So here’s my Astrological Activity broken down by month …..
Maybe I’m an Astrologer geek but I do think there’s something pretty neat about taking a look at your life in this way. It’s totally non-evasive and just allows you to see how active your upcoming year will be. You could compare any year to another too …. the possibilities are endless! 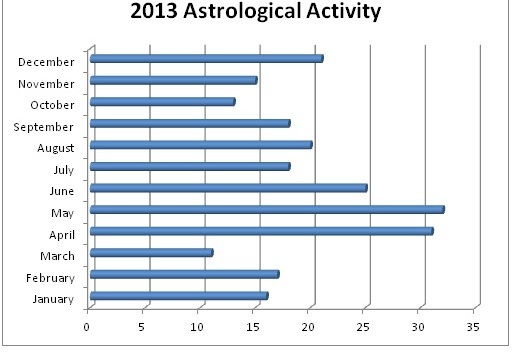 If you are interested in taking a look at your 2013 Datastrology or just want to hear more about what’s going on in your 2013 email me at info@crystalbastrology.com. Shopping on THIS Black Friday is going to be more than interesting! I had mentioned my love of deals a few posts ago and since I’m in this heightened “deal finding” state I was thinking about going out on Black Friday. Now – I’ve NEVER hit the stores on the craziest shopping day of the year. Mainly because I’m mostly an internet shopper and well frankly because I can’t take the crowds of people. I had touched base with one of my good friends – who is the “Black Friday Goddess” in my opinion since she knows exactly what to hit first and where. She told me that it’s total mayhem out there but totally worth it. When telling me about what to expect she mentioned things like “deer seeing headlights,” total insanity and shopping throughout the night. I was intrigued but scared at the same time! Could I be able to face the crowds and come home with a ton of amazing deals? So I began to ponder the thought of trying to catch a good deal while battling the mobs. AND then it hit me …. Black Friday is on November 25th this year and do you know what that means? It means that it’s the SAME day as the Solar Eclipse! Those of you that have been getting my readings know that eclipses bring a power punch of events to our table – if we are affected. However – eclipses in general make crazy and unexpected things happen. I wonder what this could mean for all those shoppers out there running to try to catch a good deal? Here’s to the biggest shopping day of the year and all the wonders it may bring to each of you! Is Outrunning Your Difficult Transits Possible? In Astrology there are conjunctions, trines and squares and these are the three biggest planetary alignments that can create events in our lives. I would think that every Astrologer has their own way of analyzing these combinations – just as I have my own. With Astrology being a picture language – predictive Astrology is very much open to interpretation. Rather than complicate matters (although Astrology is complicated!) and tell you the details behind each combination – I’ll just stick to the easy answers. A trine is great – a square is not so great – and well a conjunction can go both ways! Remember Astrology is complicated 😉 Everyone loves to hear about the trines …. and seriously who wouldn’t want to know that something good is coming up! However, when it’s time to mention those darn squares things get rather troublesome. A square challenges us – and most often it presents us with a a situation that can be stressful. What’s important to remember – however – is that without challenge we never act. So if you want to lead a life that’s pretty boring then you’ll want a lot of trines. BUT if you want things to happen in your life then you’ve got to be challenged in order to push forward and get done what needs to get done. Is it easy … no certainly not! But once the challenges pass there are usually a lot of benefits that can be found when the dust settles. I’m actually in the process of trying to outrun a few squares myself and it’s an interesting process. Earlier in the week – I breathed a sigh of relief as my “challenging” day passed and nothing came to pass. However – the very NEXT day an event found me which satisfied the challenge that the planets needed me to face. I always tell people that things can happen a few days before or after the date of the combination and I neglected give the AFTER much consideration in my own life. I learned my lesson!!! Squares are going to create a challenge for you so if there’s one on the horizon you can expect that things will not necessarily go the way you want. It’s not a time to have a confrontation with someone, ask for a favor or put yourself in a situation that could create some conflict for you. The best thing to do is ride it out and wait for the square to pass AND then do what you need to do. For one thing is certain and that is that things typically do not go our way when the planets are working against us. You can use your trines, or beneficial combinations in the exact same way. If you know a good day is coming up – then it’s time to put yourself out there and shine! When the planets are working for you it’s a beautiful thing and we should reap the benefits of what they can offer. It is ultimately up to you to put yourself out there – though. The planets can help you out and create opportunities but because of our free will it’s up to us see them and grasp the benefits offered.